I figured out the machine. I bought some cotton batting. 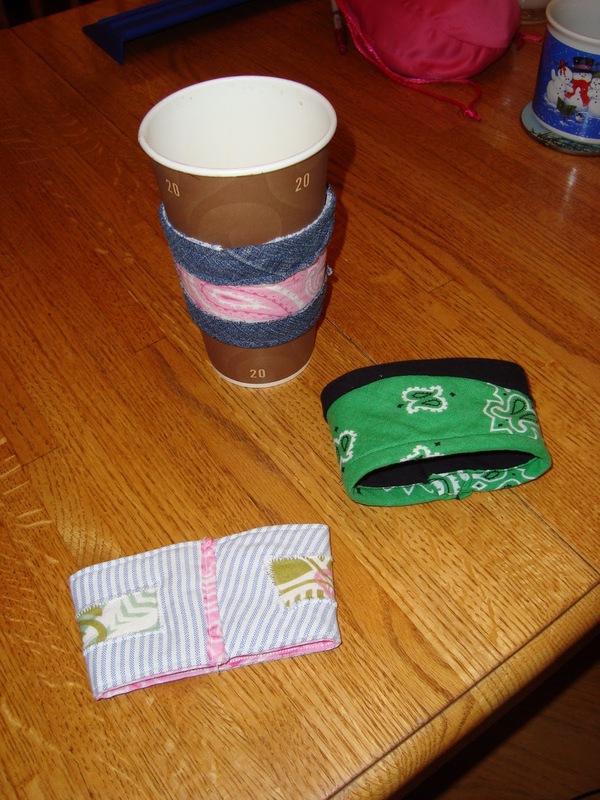 Then I took the old shirts, jeans, fabrics, etc that I had collected and washed and used a cardboard coffee sleeve to use as a template. Once I made my first, I figured out how many I needed to make per week in order to have them ready to give as Christmas gifts and voila! What Do You Do with Your Techno-Junk? Electronic waste accounts for 70 percent of the overall toxic waste currently found in landfills. It's a bowl made from an old vinyl record album ("Saturday Night Fever" actually!). My son picked this up for me in Philly. I really love this. It's an album from my era and looks great as a decorative bowl on my piano. This makes me think about how we sometimes have a hard time parting with the things that were connected with our youth - even though we may never even pull them out of their storage boxes again. And, especially when it comes to technology, even if we do venture a trip down memory lane the things we find may be unusable or toxic to just throw in the garbage. If you're hanging on to records, cds or computer discs that you no longer have the technology with which to run them on, you have some choices. Try a craft. For vinyl records, you can actually make your own bowl like the one my son gave me. Old cds can be turned into all sorts of other items: coasters, sun-catchers, even clocks! If you don't feel up to crafting but are still motivated to clear out some old stuff, make sure you dispose of your techno-junk responsibly. Participate in local electronics recycling events in your area or check Earth911 to find out how and where to dispose of it. Dare I say, Spring is finally here? Yes, I am going to take the bold step forward and declare it! And, with the promise of warmer days ahead, we can turn our sights to venturing outside and preparing our gardens. Whether you have a large yard, just a small patch of earth, or even if your springtime greenery is indoors, there are ways you can enjoy the cathartic act of planting without spending more than the price of the seeds or plants. Sprucing up your garden with a new theme or creating a new planting space, inside or out, can be done simply through the use of some of the things you have lying around your house. An old pair of worn out work boots make a great containers for outdoor flowers. A brightly colored chipped piece of pottery adds it's own color to greenery. An old mug that you like or a small bowl are also great options. Just last week my daughter mentioned a planting idea she had seen that she'd like to try in her apartment. It is to use hanging shoe pockets. I love this idea and think it would also be great for growing an assortment of herbs in or near the kitchen. What fun! Take a look. "And the tree was happy"
Electronic correspondence is truly a wonder. We can keep in touch more than ever with our families, friends, associates, clients and acquaintences. We are able to set up holiday, birthday, anniversary and special event reminders and then to follow up by sending an "e"-card to acknowledge them - amazing! Yet, there are still many of us who enjoy checking the snail-mail box and and finding an actual piece of correspondence. For instance, the Hallmark company estimates that Americans send out approximately 57 million cards. We will send about two and a half times that for Mother's Day. way can be a treasure more than any other "thing" we might give. But giving doesn't have to stop there. Our life cycles continue and it is important for us to continue to thank, honor and return the favor to the givers. Keep one manila envelope in a file. Shred the envelopes and toss in the greeting cards you have received and are done with. When the envelope is full, send it to St. Judes Ranch for Children to be made into new cards. They accept all types of cards (Thank You, Get Well, Birthday, Mother's Day, etc). The path to conservation starts on your doorstep. So, is yours one of those families who like to save corks? Well, mine is. It's a habit that seems to go on throughout the generations of my family. At one point in time, I remember a scare about the worlds supply of natural cork running out and the eventuality of having only synthetic corks to use. This, I must admit, is not something that I can verify nor have witnessed at all. 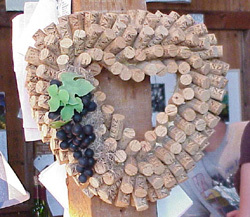 There seems to be no shortage of wine, and no shortage of natural cork. Still, I still continue my obsession with saving corks! Several years back, my brother gifted us all with hotplates made from some of the corks he had collected. This was especially appreciated since my brother's good taste afforded a nice display of a wide variety. Kits for projects like this are available in many common house-ware stores. It's always a good idea to have an end purpose in mind (like my brother's cork hotplates) for anything that you like to collect. Collecting can be a fun pastime, but finding a way to enjoy and share your collections is a way to enrich your life.